The white paper, titled “Cultural Protection and Development in Xinjiang,” follows a week of mounting pressure on the Chinese government to admit to interning an estimated million Uighurs and other ethnic minorities in these camps and forcing them to praise the Communist Party and learn Mandarin, a language barely spoken in the province. China’s State Council argues in the paper that the ethnic and religious minorities present in Xinjiang have the full freedom to exist, as long as they follow the guidance of the Communist Party and learn Mandarin. The paper does not address the internment camps. “The government has worked to modernize ethnic cultures, to strengthen cultural exchanges with foreign countries, and to enhance each group’s cultural confidence while engaging in exchanges with and mutual learning from others,” the white paper declares. On the issue of religion, the Chinese government white paper makes the case that, through strictly regulating religious documents, translations, and rituals, the Communist Party is making religious people in Xinjiang freer. Religious circles in Xinjiang are encouraged to promote social harmony and development as well as cultural progress with the aid of religious doctrines and rules, and elaborate on the doctrines and rules that contribute to China’s development and conform to China’s traditions. The Chinese state-run newspaper, Global Times, argued on Thursday that the white paper was necessary in light of “ongoing Western accusations against human rights,” citing Chinese government mouthpieces who dismiss human rights concerns among the Uighur minority as “complete nonsense.” China has dealt with more international action this week against its suppression of the Uighurs as reports mount detailing the thousands forcibly taken from their homes to internment camps – the conclusion of years of policies under Communist Party leader Xi Jinping to eradicate both Islam, generally, and Uighur culture, specifically, from Xinjiang. On Wednesday, lawmakers in the U.S. Congress introduced legislation to sanction Chinese Communist Party officials, including the senior administrator in Xinjiang, over the development of the camps. A day later, Reuters reported that a coalition of 15 ambassadors from Western nations issued a letter to Beijing demanding they be allowed to observe the camps, which China describes as “vocational centers,” and confirm that the government’s claims that no human rights abuses occur there are accurate. “I see no reason why they are concerned about the situation in Xinjiang and why they try to pressure the Chinese side by raising these demands in a co-signed letter,” Hua insisted. 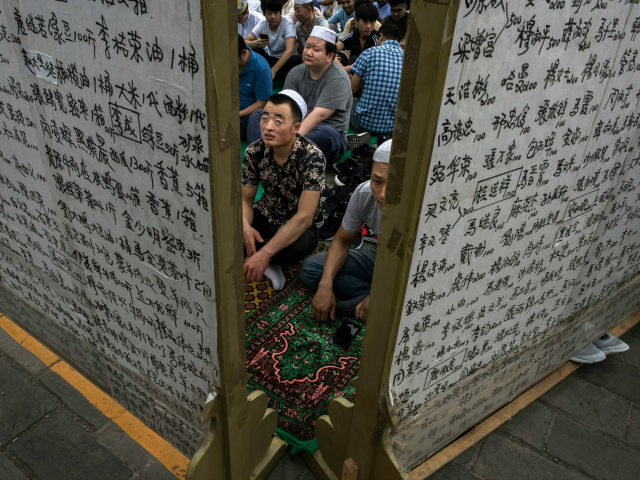 In April, the Chinese government once again published a white paper, this time titled “China’s Policies and Practices on Protecting Freedom of Religious Belief.” The paper found no flaws with the way the government handled the repression of public displays of faith and covered not just Uighur Muslims, but other persecuted minorities, such as Tibetan Buddhists and the diverse ethnic pool of Chinese Christians.